That is a winner! My boys will love it. Thanks! I can't wait to try this out. My kids love pizza and this will be a great snack or dinner. That looks like a great recipe. I am going to try it with my homemade bread dough. Thanks for sharing this recipe! Could the pizza dough that comes like canned biscuits be used? Lori, I'm sure the canned pizza dough would work fine. You would probably need to use two cans. 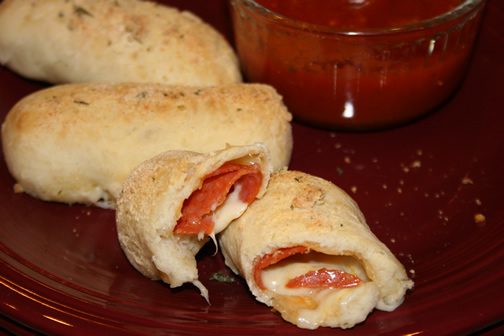 Cindy, I made your pepperoni pizza sticks for lunch today, and they were awesome! Thanks for the great recipe! I made these using my mother-in-law's dough recipe, and then she just happened to come over for dinner that night. I didn't seal them well enough and a lot of cheese melted out, but they were still a hit! My husband and his mama both loved them. :) Thank you for the idea! I love your site and refer to it often when I am making my meal plan. Do you think I could make a huge batch and freeze them?